“Quo Vadis?”. That is what most recently appointed Cabinet ministers in Europe, China, and the USA will ask themselves during the endless quarrels over money and budgets they have to attend. Where do we go from here? Centuries of violent clashes between empires have passed, each trying to impose dominance of their own central rules, prejudices and belief systems at the expense of those of other nation states. In more recent decades we see a zig-zag movement of rulers and elites that expect all solutions, blessings and virtues from either “the State” (socialism) or “the Market” (capitalism). By zig-zagging I mean that successive governments have either a Leftwing or Rightwing mindset. And when that does not work they change direction towards the other extreme. In two-party countries like UK and the USA these are Labour / Democrats and Tories / Republican Party, respectively. In general “society” expects that ‘the State should do this or that’ (even young people in France say that) or the other extreme: that everything, even Health Care and the legal system “should work more efficiently in a competitive market situation”. And when the policy doesn’t turn out to work as expected (state ineffectiveness, market failures respectively) the tide turns and the solution is sought by the opposite extreme: the government is changed and another mentally uniform political party is promising to solve everything. Unfortunately it turns out that neither one idealistic ruling doctrine can do everything best on behalf of its citizens. No more “isms” please! A. Today larger parts of the population are educated much better and are skilled in crafts (that evolve very quickly while doing and learning them), on physical as well as knowledge based tasks. The result is that citizens are indeed more emancipated and less submissive to higher placed authorities of any kind. Policepersons, teachers, scientists, doctors, judges, priests, parents, bosses, etc. ; all are challenged to prove their effective knowledge and ability to lead constructively and learn from experiences. Citizens start to reject traditional teaching and sit-back-and-being-told what to do by statespersons or broadcasts from marketing advertisements by a professional elite from corporate producers. Citizens now organize their own learning and entertainment instead and flock together to do so, using internet and social network tools in the new “making-and-doing culture”. B. The other massive trend at work for decades, is the digitization of nearly every (business-) process and task in society. No, I do not mean that ICT computer systems will take over all kinds of work. The more realistic trend is that combinations of (groups of ) humans can connect and work together woven into computer networks, transacting in value chains. Information and Communication Technology slowly but persistently permeates into every kind of work and construction. The impact of the Internet on companies is huge. Information flows make walls, boundaries and borders transparent. Big brothers and little brothers & sisters can see each others activities. ICT is innovative, quality improving, speeding up transactions not only between departments of organizations but also transcompany in value chains. And it is unfortunately also disruptive. About 9 out of 10 repetitive administrative office jobs are replaced by computer systems. Lots of middle management supervisory jobs are becoming redundant. Internet is even starting to turn companies insides-out and outsides-in. An example of that are airlines which have transformed themselves into internet based reservation and communication systems as their primary process, instead of flying. Information, human intelligence & creativity and energy is what makes society work and flow. A modern German car for instance is to be seen as “a flock of hundreds of computers that fly over the autobahn in formation”, as someone in Detroit recently remarked. Philips Electronics has started selling LED light systems that can be steered remotely by wireless datacom in color and power by internet address. So the combinations are powerful! The problem is that the new human & computer symbiosis grows relatively slow at first (exponential) and that the ICT is now built into systems and interconnected hidden in such a way that it is hardly visible from the outside like the in the cars I mentioned: somewhere under the hood. Only in indirect ways, like during malfunctions, damage to the infrastructure or repairs the politicians and public notices that wireless & optic communication and electronic storage and processing with hardware and software are now present all around us, and that nearly everything grinds to a halt if ICT fails like in the recent storm in New York. Data = the new oil, fuel for the motors in our economies. Only when ICT and its infrastructures are made more visible and are taken seriously into account in policy projects and budgets, then we can rely on the new “motors” to work and stay working. Unfortunately most of the leadership of corporations and countries is not aware of the changes A and B that have taken place in the context of their subjects: the businesses and population. For instance in the “new government agreement ” of our brand new NL national government ICT is only once mentioned and only certain symptoms are declared as policy issues. The importance of the information infrastructure nor the vital role of networks and systems is not addressed or included in visions on policy that matters. As if nothing has changed since the 1980′s. The leaders do know that ICT and social networks are used and people are more educated but have failed to detect what the impact on organizations, groups of civilians and characteristics of jobs has been. The tools are not neutral stuff and do have an effect on the users. Not surprising that all over the world economies have started to malfunction under outdated ways of government and have been overruled by financial companies that grew out of all former proportions by using very powerful and blindingly fast worldwide computer networks. The banksters are extracting value without producing or creating anything. 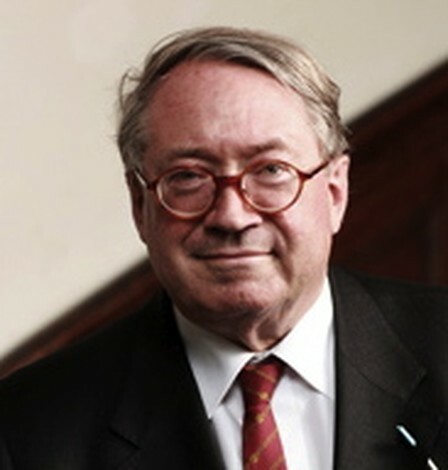 Banks, accountants and insurance companies had and will have a certain functionality as lubricants of transactions, as record keepers and as platforms for sharing risks; however they should never be seen as if they are the business processes themselves and do not have to answer to public governance. So what should we do to get out of this crisis? In 2000 Prof. Carlota Perez has already described that the cliff(s) we have fallen into during the present economic crash have been seen before in history as halfway in a huge technology and wealth growth curve. Usually when several new technology rollouts have been very successful but the real indepth understanding of meaning and uses and effects of the new technology (in this case ICT & telecoms & Internet) has not really sunk in into the minds of the rulers. A lot of things have to be rethought and redefined to get out of the canyon. In this article I present one of the first steps. The Civil Society in its simplest form consist of the individual citizens. In groups the citizens together do voluntary work or contribute content to social networks. Examples are Red Cross, Amnesty International, WikiPedia, InstaGram, @nabuur, Medecins Sans Frontieres, ISOC an RIPE. They contribute, P2P cooperate, help, construct, solve problems, educate, explore, etc. etc. Characteristic is that money is present but does not play the all-important role, like in commercial risk-taking ventures. These citizens are no longer part of state controlled institutions, political parties or hierarchies. These two characteristics make these citizen groups less visible to state and business. Until recently. The volunteer groups are no longer without influence. They can get dictators non-violently removed and presidents elected, right? Isn’t this “Democracy” as it was always defined: The Rule of the People?. The very fact that the Occupy movements and the Pirate Parties explicitly use no violence or destruction makes them ‘no news’ and invisible for the broadcasting media, who live on exposing scandals and violence and other memes based attention grabbers. Other volunteer groups like the Anonymous hacktivists show that they do have opinions to express and to implement. In a more constructive way we see the Civil Society restart local cooperative sustainable food production, energy generation, and physical manufacturing of goods by the “Maker Movement”, Phyles (P2P Cooperatives). And the open source software developers, that work Trans-National. The organizational fundaments of these groups are the concept of the “Vitality of the Commons”, discussed on the P2PFoundation.org site. People together put more into the “P2P commons” than they take out. The impact of ICT, mobile data and Internet use is huge on society. ‘Time’ and ‘space’ (location), which was very well constrained and bounded for physical processes, is influenced by ICT and we can now redefine the old organization of activities. The Trias Internetica is a framework to show such a new division of functions: where the different functions and roles of (groups of) people should be ‘positioned’. And we ourselves can be less constrained by the former boundaries of place and time. Most of us can now change roles during the day: banker in the morning, doing bike repair in the afternoon and stamp collector in the evening. I personally have worked often for ministerial projects, have my own company and am volunteer in several organizations. So the Trias framework does not divide and segregate people into the three groups. The crux is that each pole concentrates on doing its own specialized role right without aspiring to do the roles of the other two as well. And it is just to show that there IS a third pole besides State and Market. Interestingly the poles have pairwise 2:1 properties, like general interest/self interest or taking risks /risk avoidance. 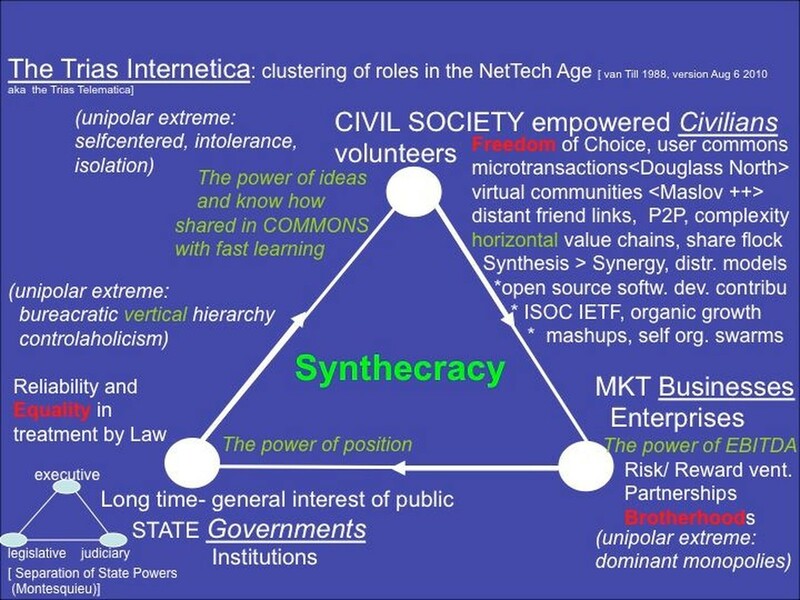 In the schematic I also show what usually goes wrong when one pole grows out of proportion: Stifling state bureaucracy and corruption, standstill dominant business monopolies, and one-solution destructive-intolerant extremists. I sincerely hope that the new governments recently formed in Europe, the USA and the Republic of China stop focusing exclusively on wealth (re)distribution and start to concentrate on the people & mechanisms that create value and wealth: the motors that drive our economies and create work and jobs. Not only is value creation the hallmark of the Civil Society able members (including artists, designers, engineers and craftspeople) and specialized activities, the three poles are not exclusive option islands. Most powerful and constructive will be bridged combinations of people from volunteers, ministries & institutions and small business ventures that synthesize solutions to complex problems and learn fast in a diverse and dynamic environment. 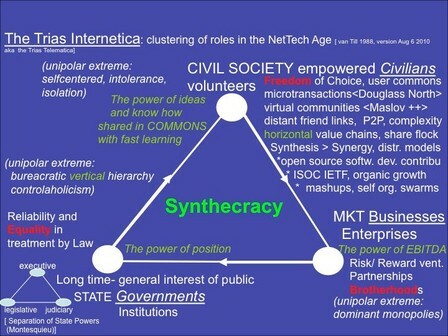 That is how sustainable synergy is created: in networks of humans and machines, connected and linked so that each contributes from what they are especially very good at. Zijn Europese Grondrechten van toepassing op de Wiv 2017?